My son looks like Harry Potter. Wherever we go people mention it! 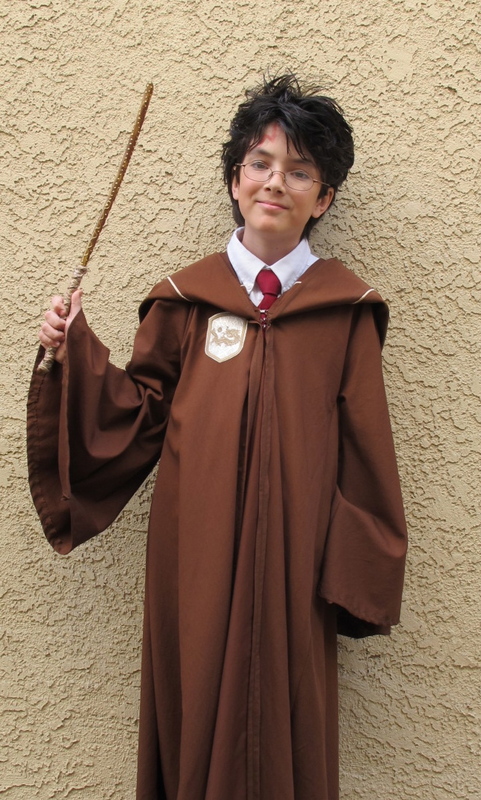 Recently, he was invited to be the guest of honor at a "Hogwarts" themed birthday party. So, I had to come up with a quick costume. I don't have a full tutorial for you, but just wanted to show the cloak and wand that I made for him. The cloak was cut from a king size flat sheet. It's the shape of a basic graduation gown with a long pointed hood. I added three hook and eyes to close it. And a crest school patch. Pretty good for an afternoon's work and only $4 spent for the crest! The wand was made from a tree branch that I sanded and then wrapped the handle part in yarn. The rest of it I varnished and painted gold dimensional paint squiggles and dots on it. I think he looks magical and the kids at the party loved it!